One of the wonderful legacies of Jim Lewis that we at CONTINUUM are honored to fulfill is his wish to continue support of creativity, investigative thinking, and networking within the astrological and research community. For 14 years, CONTINUUM was able to offer individual grants to the astrological community though residuals from distributors of products generated by Jim Lewis's software and writing. Once Solar Fire and other software makers produced similar mapping programs and Astronumerics ceased to operate in the United States, our residual monies evaporated to the point that we were no longer able to offer grants or scholarships. As of 2011, we have only been able to cover the costs related to maintenance of this website. One endeavor we are especially proud of supporting is Kepler College of Astrological Arts and Sciences since its inception. For in-depth information, visit their website. Continuum has pledged money to Kepler to secure a star for Jim Lewis in the Founder's Circle of Stars but we still have to raise some of the money. It is our hope that all those who have benefited from Jim's teaching will join us in fulfilling this pledge by donating whatever your budget will allow. 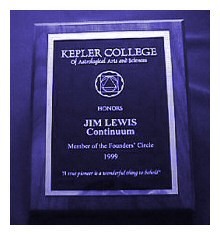 Please mention that your donation to Kepler is to help pay for the Jim Lewis star. All donations to Kepler are tax deductible. CREDITS: This web site was originally created by Donna Cunningham. Though Donna left us on her 75th birthday, July 5, 2017, we will always be grateful for her selfless commitment and immense contributions to the promotion of astrological excellence through her teaching, writing and practice. This background used with permission of Montserrat of The Sacred Feminine.